I love diving in to the Topper’s Mountain wines. Always interesting, always high quality, even though they don’t always work. Intrigue a go-go. This red is a blend of Tempranillo (60%), Tannat (15%), Nebbiolo (15%) and Barbera (10%). Spain meets south of France meets Piedmont. Woah. TA 7.24 pH 3.39. 24 months in oak. Interestingly, I’ve never really noticed overt oak in a Topper’s wine, but this looks quite caramelised. Coffeed even. I do love the suggestion of sticky, ferrous Nebbiolo tannins and tarry edges though, even if the wines framework looks a bit bony and astringent. 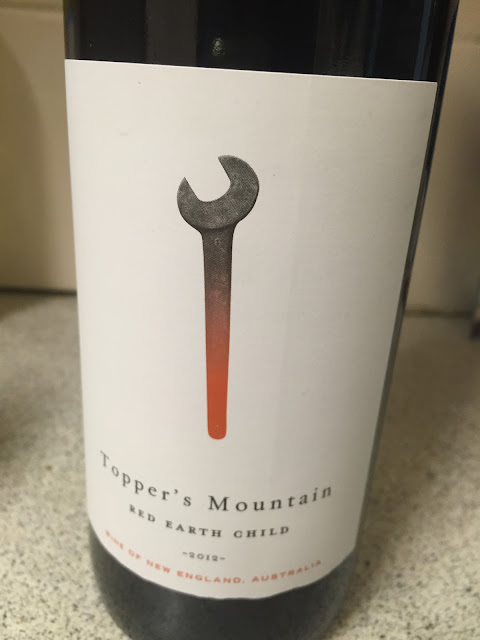 Still that’s selling this wine short, for there is red earth (yes, following the name) tinged fruit weight too, the tannins carrying a firm Neb stamp and the finish long. It’s still dry, a little hard and the main richness is as much about oak as anything else, yet there is also a depth and length here that marks this as a thoughtful wine. It’s awkward and pointy, but still genuine and real. Would I buy it? Maybe not. But I’d still like to see how this matures.